I finished it before Christmas, but because of celebrations and weather the photos had to wait until today. 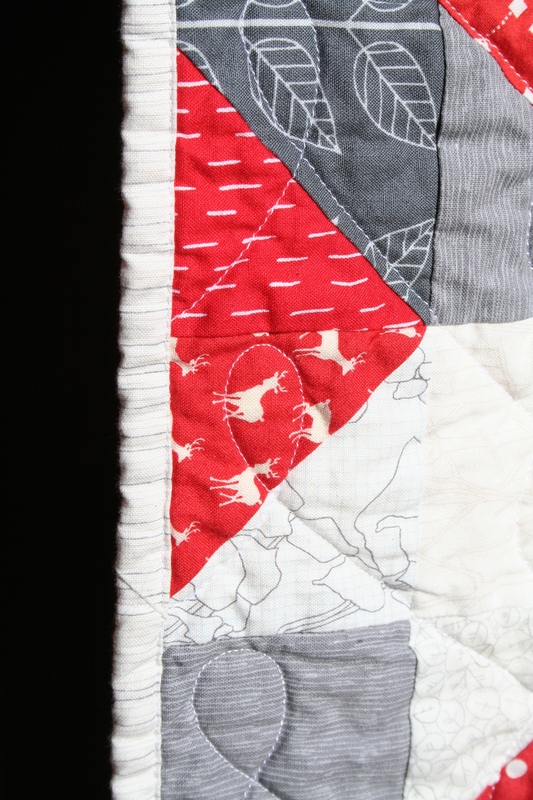 I’ve written about this quilt at almost every stage of its creation, but I have to tell the full story here. This was a bee quilt for my NJMQG block party group. I decided I wanted a Christmas quilt to go with our holiday decorations, one that would come out for snuggling in the darkest months of the year. I found some inspiration and designed something rather traditional that would use a palette of red, white, and gray. I found a way to use a single block that, assembled, would make stars and “snowflakes,” which are both major themes of our Christmas tree ornaments (the pattern is here). 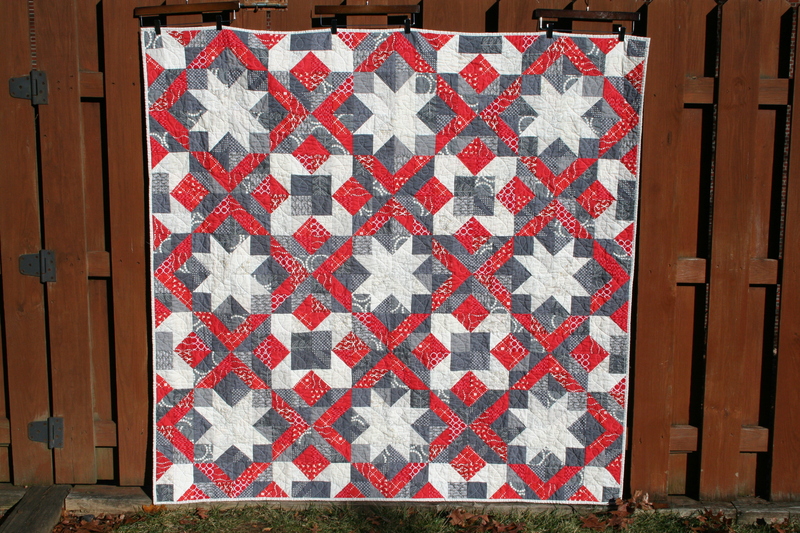 It is quilted in loops by the lovely Stephanie of Late Night Quilter (who, by the way, is still offering 10% off and free batting to readers of this here blog). It crinkled up perfectly. It’s bound with a perfect understated stripe from Carolyn Friedlander’s Botanics line. It looks great in the living room (I put it on the floor because the couch is on the opposite side of the room from the tree). Thank you to my bee mates and Stephanie for making my Christmas wishes come true. 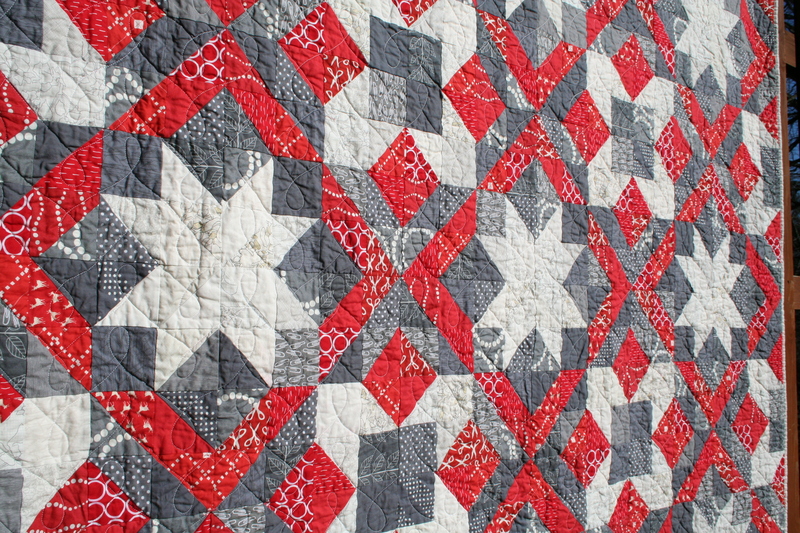 One of my favourite colour combinations, and a beautiful pattern for a Christmas quilt. Lovely work! Thanks, Kate! I hope your Christmas was lovely. 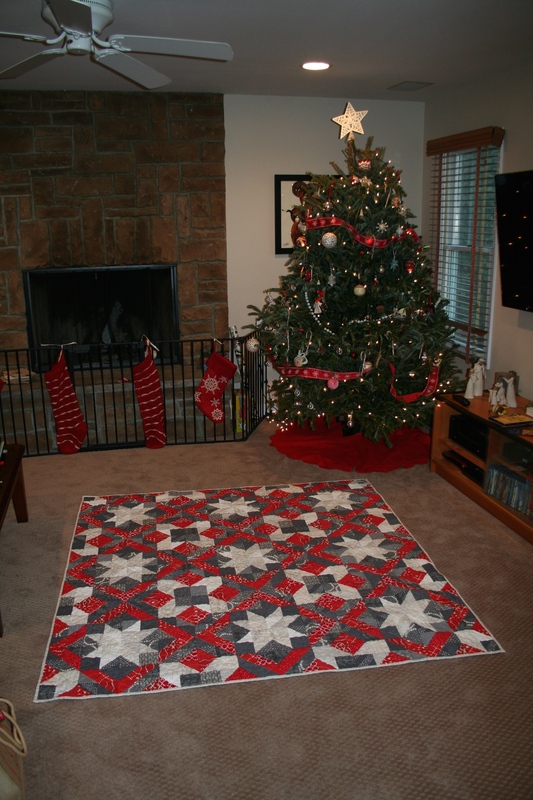 Beautiful Christmas quilt!! Like the pattern and your palette choice!! Thank you! And to you and yours as well!